Home / Automotive / Cars / A 1600bhp Markiii Vw Golf Vr6... Er... Vr12? It's Faster Than You Think! Not happy with the performance of your VW Golf VR6? Well, the answer is to simply put another motor in the boot and have two. Think we're kidding? Nope, we're being deadly serious. This dragster has two engines – making it a VR12. What's more, both engines are turbocharged too. In fact, it's got two of almost everything including handbrakes and transmissions as the front engine drives the front wheels and the rear one drives the rear wheels. Which is quite a spectacle when it does two burnouts before getting to the start line. 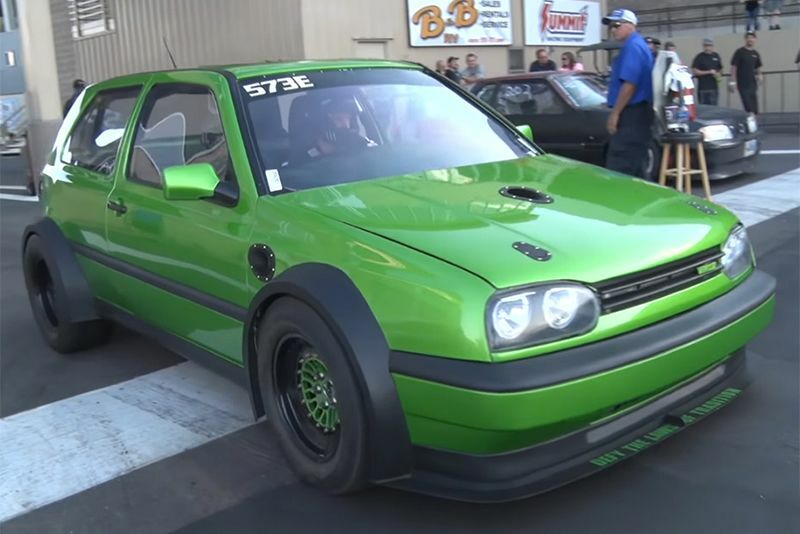 Once the sequential gearboxes are coupled together, making it essentially a four-wheel-drive, and the lights go out the combined 1600bhp slingshots the MarkIII Golf a quarter-mile in just 9 seconds while it'll hit 180mph over the half-mile. Fast enough for it to require a parachute brake. According to the owner, a slick body kit to aid downforce will help improve stability which, in turn, will allow him to unleash the green missile's full potential. It's unsettling to think there's more to come but, hey, when you have an exhaust on each corner of your car, who wouldn't want to go faster? So, do yourself a favour, click the play button below and be amazed!